A community energy group are launching their second share offer next week, giving local residents what could be their last opportunity to invest in a community-owned renewable energy scheme. 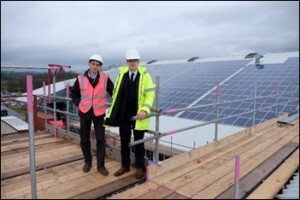 Burneside Community Energy successfully raised quarter of a million pounds from local shareholders in 2015 to install 250kW of Solar PV on the roof of James Cropper plc. That system has been running above expectation and to date, £5,000 has been earmarked for community projects. In light of the success of the first phase, the group are now planning their second installation of solar PV, again in partnership with James Cropper plc. They aim to raise an ambitious £330,000 this autumn by offering further shares in BCE, which they anticipate will generate annual interest of over 4.5%. Shares will be £1 each, with a minimum investment of £250. Director of BCE, Gill Fenna, said “On the back of the over-performance of the first phase of our installation, which was commissioned nearly three years ago, we were encouraged to go for this second phase. The second phase installation will be bigger than the first, with a system of up to 460kW being installed this winter. Gill continued “the Feed In Tariff will close at the end of March, so the plan is to install the panels from December and into the new year, so the new system can be commissioned and registered with Ofgem by the 31st March deadline. The share offer will launch at a special event on Wednesday 24th October at 7pm in The Bryce Institute, Burneside, where prospective investors can meet the directors of Burneside Community Energy, see the Share Offer Document and register to invest. The share offer will close when the target is met, or on Friday 21st November, whichever is the earlier. ­­­­The share offer is open to everyone, though in the event of oversubscription, priority will be given to residents of Burneside and employees of James Cropper. Having managed the share offers for both Burneside Community Energy’s first phase and Community Energy Cumbria’s projects, local environmental charity, Cumbria Action for Sustainability are again overseeing the administration of the share offer for phase 2. Full details will be available at the launch event, or by going to http://www.communityenergycumbria.co.uk/projects/burneside/.